Well, with just five minutes dedicated to Ayurveda and with minimum effort- it is simply possible. All we need to do is inculcate Nasya therapy in our lifestyle. Instilling the medicine (herbs or medicinal oil) via nasal passage is known as Nasya in Ayurveda. According to the season, individual’s prakruti, disorders there are many kinds of Nasya. In this article, we will summarize everything about the simplest form of nasya that can be adopted as a part of our lifestyle and done simply at home. Lie on a bed with the head hanging over the end and apply two drops of warm chosen oil/ghee into each nostril. 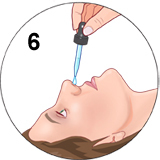 Pinch both nostrils, start to inhale and immediately remove fingers to allow for a deep inhalation – repeat several times to allow substance to penetrate sinus cavities. Massage the forehead, above and below the eyebrows, on the sides of the nose and under the cheekbones. Cough up and spit out any mucus that forms in the throat – blow your nose if necessary and do not suppress sneezing (have your tissues handy). Finish by gargling with salt water and then keep head warm and dry for rest of the day. Is it late to make this wonderful therapy a part of our lives? It is never too late. So just try it for 21 days and see its benefits for yourself.